In Jules Verne's science fiction novel Journey to the Centre of the Earth, a professor, his nephew and their guide descend into the Snæfellsjökull volcano in Iceland, then travel deep into the Earth before emerging from the Stromboli volcano in Italy. Much of what Jules Verne wrote about the Earth's interior has been shown to be demonstrably fictional since Journey to the Centre of the Earth was published in 1864. Science, my lad, is made up of mistakes, but they are mistakes that are useful to make, because they lead little by little to the truth. Verne's tale of sub-crustal Earth adventures, lit above by an electrically charged gas, contained a vast subterranean ocean. A subsurface ocean might seem far-fetched, but recent findings indicate there might indeed be a subsurface reservoir. A team of scientists lead by Graham Pearson have found the hydrophilic mineral ringwoodite in Earth's mantle at a depth of 400 to 600 kilometers indicating there could be vast subterranean water repository. 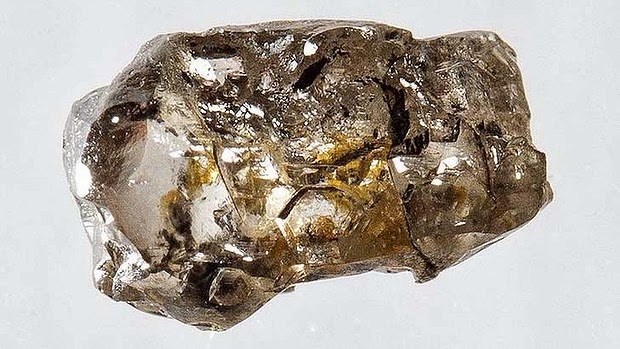 Brown diamond containing a ringwoodite sample. "This sample really provides extremely strong confirmation that there are local wet spots deep in the Earth in this area. That particular zone in the Earth, the transition zone, might have as much water as all the world's oceans put together." Alberta scientists find water reservoirs deep below Earth's surface that could rival oceans, Andrea Sands, Edmonton Journal, 12 March 2014. Earth has a secret reservoir of water, scientists say, Richard Ingham, Sydney Morning Herald, 13 March 2014. Hydrous mantle transition zone indicated by ringwoodite included within diamond, D. G. Pearson, et. al., Nature, 12 March 2014. 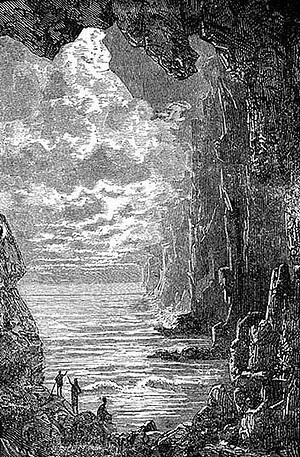 Journey to the Centre of the Earth, by Jules Verne 1864.